Visiting America's National Parks can feel like a post card come to life; from Grand Teton's mesmerizing mountain views to Yosemite's iconic plunging waterfalls. But, what about some of the newer or smaller parks that you might never have heard of? With a whopping 58 national parks across the nation, you can avoid the masses and experience some of the most spectacular and natural places that this country has to offer at these nine incredible parks. When you think Alaska, we bet that sculpted sandy dunes are not the first thing that comes to mind. Kobuk Valley National Park, America's least-visited national park, is made up of soft sand that nearly half a million caribou trek across annually just north of the Arctic Circle. Located in a very remote part of the state, visitors should be prepared for a true wilderness survival experience as there are no manmade trails here. Be prepared to experience peacefulness and solitude along the Kobuk River and some relics of the last Ice Age. This remote park in northeast California is speckled with sparkling lakes, jagged peaks, lush forests, and meadows that sprout wildflowers in the summer — but underneath all this calmness, the earth is not as quiet. 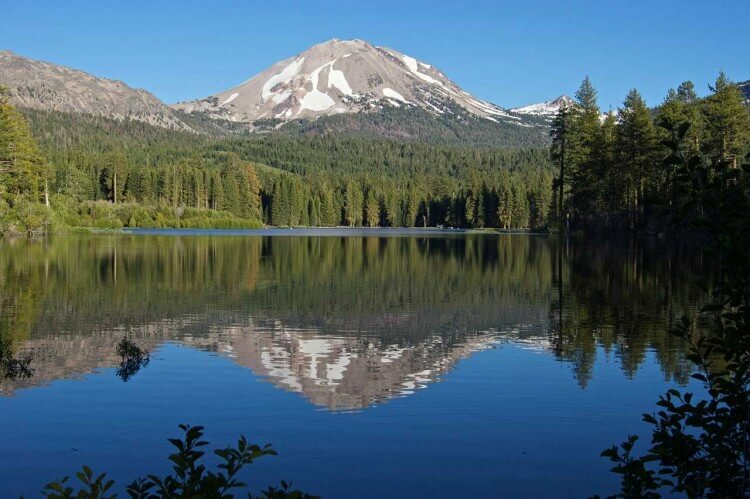 Lassen Volcanic National Park is famous for its sulpher vents, boiling springs, and its signature volcano: Lassen Peak. The volcano last erupted in 1914, and now that things have settled down, the park is a great place to learn about volcanic activity, nature, and more. Cuyahoga Valley National Park lies along the Cuyahoga River between Ohio's cities of Cleveland and Akron, and happens to be the only national park in the entire state. The park preserves and celebrates the rural landscape with secluded trails that make you forget about the nearby urban cities. Brandywine Falls is probably the most popular attraction of the park and is 65 feet of cascading hydrological beauty. Unlike many of the expansive National Parks in the western U.S., Cuyahoga Valley offers many man-made attractions such as a scenic railroad, ski slopes, and several golf courses. This 100-mile wrinkle on the Earth's surface really knows how to make you feel small. Less crowded than other national parks in Utah, Capitol Reef National Park evokes a sense of peacefulness as you explore its jagged desert rocks, hidden arches, deep canyons, and other awe-inspiring formations. The park derives its name from the word "reef," which is a popular term for ridge of uplifted rock and the many white Navajo sandstone domes that look similar to our nation's Capitol Building. This 22,200-acre park is a sanctuary for a diverse range of plants and animals, and is home to some of the tallest trees on the east coast. Located along the Congaree River in South Carolina, when the waters get high, you might think "swamp." But, Congaree National Park is actually a dynamic river floodplain that helps sustain the biodiversity of the park by supplying a range of nutrients to all the flora and fauna. There is plenty for everyone to do here — whether you want to take a leisurely stroll down one of the many man-made board walks or plan a canoe trip down Cedar Creek. Though it's within sight of downtown Miami, Florida, Biscayne National Park is a small oasis that protects crystal clear waters, emerald islands, and colorful coral reefs. Outdoor enthusiasts can snorkel, go boating, camp, fish, explore ship wrecks, and more in this beautifully preserved piece of history. Biscayne has a dizzying array of adventures and treasures just waiting to be explored. This remote island surrounded by Lake Superior offers unparalleled isolation for those looking to really connect with nature. Isle Royale National Park's scenic beauty is wild and untamed and is only accessible by boat or sea plane. Kayak the rocky coast line, scuba dive beneath the waves, camp amongst the hushed dense forest, or hike the untouched landscape. If you choose to visit this park, know that there will be a lot of forging your own trail through rough Michigan wilderness. In west Texas lays Guadalupe Mountains National Park, home of the world's largest Permian-period geological fossil reef, as well as Texas' four highest peaks. Visitors can hike on more than 80 miles of trails through canyons, over vistas, and beneath shady glades. There was once an ancient sea that covered the area, and though it has long dried up it has left one of the world's most preserved fossil reefs just waiting to be explored. As one of the nation's most hidden gems, Black Canyon of the Gunnison National Park in southwest Colorado is breathtakingly beautiful. The dark granite walls of the canyon were carved over millions of years and rise steeply more than 2,000 feet above the Gunnison River below, allowing little sunlight into its depths. Get treated to spectacular views and plenty of activities no matter the season. While a playground for experienced rock climbers, it also boasts scenic hikes, fishing, snowshoeing, camping, and more.